The H-index captures output based on the total number of publications and the total number of citations to those works, providing a focused snapshot of an individual’s research performance. 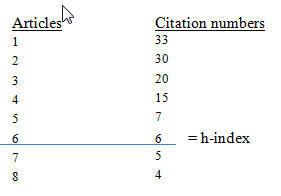 Example: If a researcher has 15 papers, each of which has at least 15 citations, their h-index is 15. Comparing researchers of similar career length. Comparing researchers in similar field, subject, or Department, and who publish in the same journal categories. Obtaining a focused snapshot of a researcher’s performance. Comparing researchers from different fields, disciplines, or subjects. Assessing fields, departments, and subjects where research output is typically books or conference proceedings as they are not well represented by databases providing h-indices. Given Scopus and Web of Science's citation-tracking functionality, they also calculate an individual’s h-index based on content in a particular database. Likewise, Google Scholar collects citations and calculates an author's h-index via the Google Scholar Citations Profile feature. Note that each database may determine a different h-index for the same individual as the content in each database is unique and different. To manually calculate your h-index, organize articles in descending order, based on the number of times they have been cited (see below example). Web of Science, Scopus, and Google Scholar can also be used to calculate an h-index for that particular citation-tracking database. In the below example, an author has 8 papers that have been cited 33, 30, 20, 15, 7, 6, 5 and 4 times. This tells us that the author's h-index is 6. What does an h-index of 6 mean? An h-index of 6 means that this author has published at least 6 papers that have each received at least 6 citations. The final two papers have no effect in this case as they have been cited less than six times (Ireland, MacDonald & Stirling, 2013).